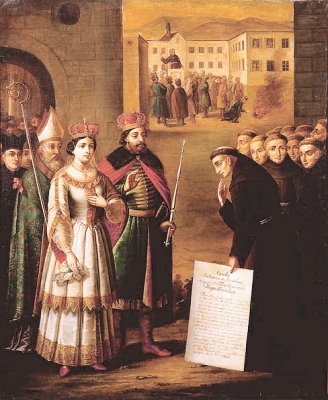 Saint John of Capistrano was a very successful young man, having read law at the University of Perugia and later being honored as governor of Perugia. It wasn't until a war with the supporters of Malatesta that he was captured and thrown into a dungeon that John converted to Christianity. Upon his release, he joind the strict life of the Franciscan Order. As a Franciscan friar, he assisted Saint Bernardine of Siena. The combination of John's devout faith and knowledge of law made him and easy choice as a papal emissary. His skill as a public speaker proved useful to the conversion and renewed devotion many who came to hear him preach. Later, John of Capistrano, was named a papal inquisitor, where he was chosen to address activities of the Hussites. John was feared and hated among the Church's rival Calvanists. In 1453, the Turks captured Constantinople and reading to move on Christian Europe. Concerned about the possibility that the Turks might overrun western Christendom the way they had conquered the east, John of Capistrano tried but failed to rally support from Austria and Bavaria to mount a counter-attack the Turkish invader. By 1456, the Turks were now threatening Belgrade. John, using his oratory skills, convinced the Hungarian general Janos Hunyadi to rally the Hungarian troops in support of his cause. The Turks were eventually defeated and western Europe was saved. John of Capistrano died of the plague shortly after his successful battle at Belgrade. Also known as Giovanni da Capistrano (Italian).